At a time when questions are being asked about the longevity of the 'grand alliance' in Bihar, Congress President Sonia Gandhi and Vice-President Rahul Gandhi have moved swiftly in the last two days to reach out to Bihar Chief Minister Nitish Kumar. This comes despite the criticism of Nitish Kumar by senior Congress leaders. The Congress president phoned Kumar on Wednesday morning and thanked him for Janata Dal (United) or JD(U)'s support to the Opposition's common candidate for the vice-presidential polls. Kumar heads the JD(U). According to JD(U) sources, Rahul Gandhi had also phoned the Bihar CM on Tuesday evening, after the meeting of the 18 Opposition parties that decided to field former diplomat Gopalkrishna Gandhi as their vice-presidential nominee. The Congress vice-president had also suggested to Kumar that they should meet. Kumar is slated to be in New Delhi on July 22 and 23 to attend his party's national executive meeting and is likely to meet Opposition leaders, including Rahul Gandhi. In New Delhi, Congress as well as JD(U) leaders also attempted to dismiss speculation that the JD(U) and Rashtriya Janata Dal (RJD) alliance in Bihar was on the brink after Kumar and his party had asked RJD chief Lalu Prasad's son and Bihar Deputy CM Tejaswi Yadav to come clean on the corruption charges against him and to put his case in front of the public. Tejaswi Yadav dubbed the corruption case against him as "farzi (fake)" and cried "political vendetta". The JD(U), however, is not satisfied with the response and said that it "expects more" from the young RJD scion. "I didn't even have a moustache in 2004. How can a 13-14 years kid do all this? The CBI (Central Bureau of Investigation) FIR (First Information Report) is farzi (fake) and part of a political vendetta. BJP (Bharatiya Janata Party) President Amit Shah and Prime Minister Narendra Modi have hatched a conspiracy against me and family members out of political reasons," Tejaswi told reporters after coming out of a cabinet meeting. The young RJD leader also highlighted his achievements as a minister in the state and insisted that he always practised a policy of "zero tolerance towards corruption". Yadav holds charge of road construction, building construction and Backward and Extremely Backward Castes welfare in the Nitish cabinet. "No one can raise fingers on my tenure as the minister in [the] state. During my term, the maximum number of roads have been built. I have not done anything wrong in dispensing the responsibility. From the first day I entered office, I have been adhering to zero tolerance to corruption. Due to my work for the weaker and deprived section of the society, I am being targeted," said the Deputy CM. He also added that grand alliance will remain intact in Bihar. "They (BJP) are trying to break us, but we would not let them succeed. Mahagathbandhan will continue to remain intact," he added. However, his boss, Nitish Kumar wasn't seen as impressed by the young leader's explanations. His party, the JD(U), has clearly stated it expects "more". "At best, it was a political answer," party spokesperson Neeraj Kumar told Business Standard. ,"The CBI has filed a personal FIR on him. Therefore, we expect that he would present a point-wise response on the case." "We would respect coalition dharma till our last breath. We, at the same time, will not compromise with our policy of zero tolerance on corruption. Woh bhasha nahi, bhaw par dhayan de (They should understand the meaning, not just read the lines)," the senior JD (U) leader said. The CM also reportedly gave Tejaswi a cold shoulder during the cabinet meeting, which lasted almost half an hour. 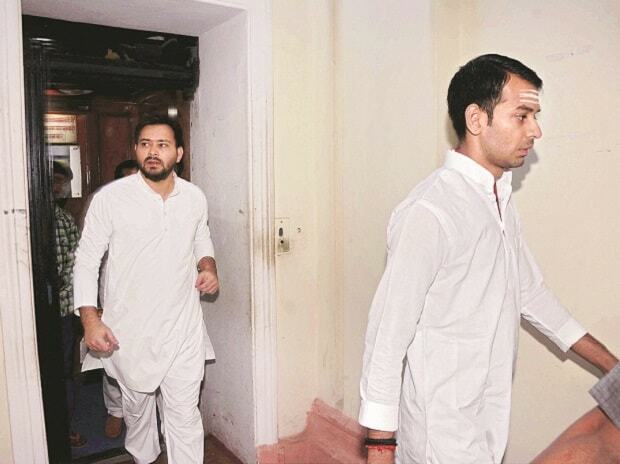 It was the first time Tejaswi met Nitish Kumar after the CBI raid at his home in Patna on Friday. "It was all gloomy. Tejaswi did greet the CM as Kumar entered the room and he responded by nodding his head. But that was it. They didn't speak to each other for the rest of the meeting. CM left as soon as the meeting ended. Normally, he stays for 4-5 minutes after the meeting for an informal chit-chat with us," said a minister present in the meeting. The CBI has lodged FIR against Lalu Prasad, Rabri Devi, Tejaswi Prasad and five others in connection with a private party allegedly giving three acres of land in Patna at a throwaway price to the Lalu family in return for getting a license to run two IRCTC hotels at Ranchi and Puri. The JD(U) gave Tejaswi a terse message on Tuesday in which the young leader was asked to "come out with facts in public against the accusations."